It was Alex's birthday weekend. I can't believe my little one is turning 6 on Tuesday! I also can't believe how busy I have been this week with work events. I am only saying this because I feel that I kind of ran out of time to cook up a storm for his birthday. I felt terrible of course but I have to say the big bowl of lollies, endless array of chips, sushi (bought from my favourite sushi man) and fairy bread seemed to keep them all happy while the mini burgers I did manage to throw together were gobbled down by the parents. 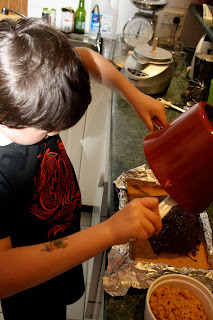 A couple of days before the party I was reading a favourite blog of mine sweetiepetitti and Susie had just posted about s'mores- they looked delicious. When I read further to hear how easy they were to make I asked for the recipe because I thought I'd whip up a batch for the party. Susie sent me the recipe in record speed- thank you! However, I didn't manage to get to them before the party...bad mummy. To make myself feel better I bought the ingredients to make them this weekend so Alex could have a little something special on his actual birthday. As I started the process late yesterday afternoon Max decided he would like to help and ended up taking control which I was thoroughly happy about. Of course Alex saw knives being used and decided he MUST help too! I am not quite at the stage of letting Alex loose with a sharp knife so I decided to give him scissors instead and that did the trick. 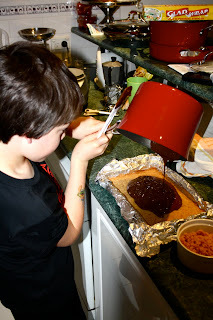 As you can see by the photos below, the boys had a brilliant time making their treat while all the adults (My sister and The-D man are here for a birthday visit) enjoyed eating them. Max enjoys seeing the melted chocolate poured all over the scotch finger biscuit base I prepared earlier (we don't have graham crackers in Australia so these were a good substitute). Well done boys- a great looking s'mores bar! Indeed I shall Nettie and thanks for stopping by! No graham crackers???? That's crazy. I shall pack some on my next, (um, first) trip to Australia. Some day. They look delicious and are certainly a friendly bar for kids. 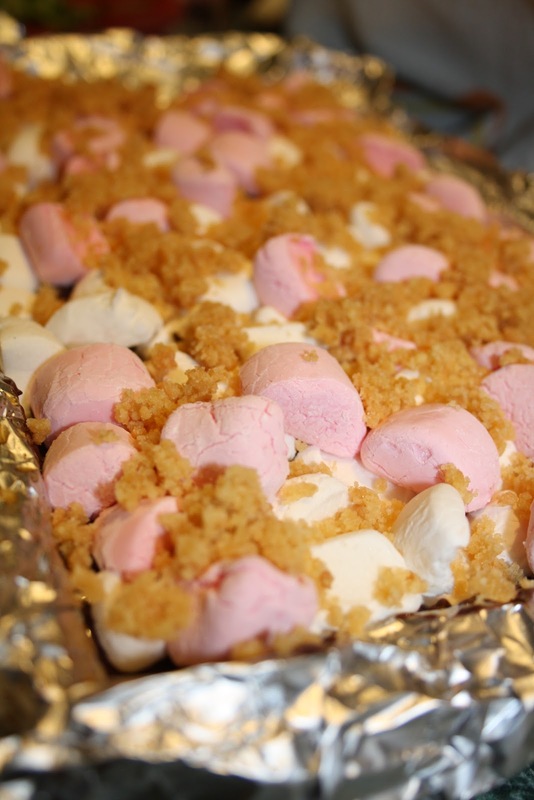 The toasted marshmallows are so delicious, we sometimes just bake those. Glad is was a happy birthday. My kids will be thrilled with this desert! It really looks yummy! Happy Birthday to your lovely boy! Anything S'more is good. Looks great my friend and Happy Birthday Alex! Say if you ever want to exchange Grahm Crackers for Vegemite I would be willing, you kinda got me hooked.